The buying process has changed, and it has forced sales teams to try new strategies to prospect and build relationships. One of most effective ways to achieve this is through social selling. But, what is social selling and why is it important? We share 38 social selling statistics that explain how social selling is helping sales teams across the globe outperform their sales targets – every year. Social selling requires more than “liking” other people’s content. We share several strategies that you can use to help you implement social selling inside your organization. It wasn’t that long ago when the only way to generate a new sales lead was to pick up the phone book, find a local business and then call them to pitch your services. For many sales reps, this is how you spent most of your days. The Internet has changed everything – especially for sales teams. You are no longer limited to just phone calls. Today you can generate new sales leads on your website, by sending emails or by hosting digital events. You can even generate new leads on social media! Social media is fast becoming the go-to channel for sales people to find new prospects and reach their sales targets. In fact, 90% of top performing sales people now use social media as part of their sales strategy. And for sales reps that do invest in social media, 64% of them hit their team quota – compared to only 49% of reps hitting their team quota that don’t use social media. Furthermore, more than 10% of social sales reps have closed 5 or more deals due to being active in social media. If you want to keep up with the ever-changing landscape of modern day sales, then you need to rethink how you can use social media as part of your sales strategy. Unfortunately, two-thirds of companies have yet to create a social media strategy for their sales organization. To help you, we’ll break down 38 social selling statistics into actionable steps to help you understand what social selling and how to use it in order to reach your sales targets. Social selling is about finding and engaging with prospects (and customers) online. Each time you login to a social media network to identify new prospects, connect with them and provide value by answering questions and sharing relevant content, you are social selling. 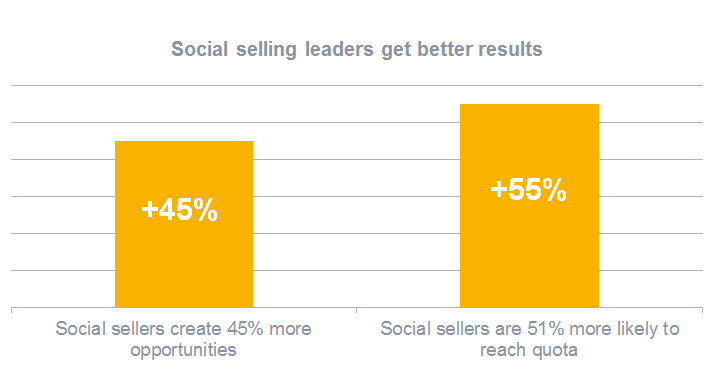 Think of social selling as a softer sales approach. It’s a long term strategy and more like a marathon, rather than the traditional sales process, which is more like a sprint. The biggest difference between social selling and traditional sales techniques is that while the latter focuses mainly on short-term sales results, social selling is more about building long lasting relationships. Long gone are the days when you could simply cold call your way to a sale. Today, buyers’ are asking questions, seeking out advice and making their final decisions – all on social media. The traditional buying process was often a one-way “conversation” between the sale rep and buyer. Reps were responsible to getting the prospects attention and convincing them that they needed the product or service that they were selling. Back then, it was only about cold calls, sales demos and qualifying leads. While all still important, the biggest change has happened to the way that people buy. Today, 67% of the buyer’s journey is now done digitally. And decision makers consume at least 5 pieces of content before engaging with a sales rep. This research on buyer behavior is further supported in a study conducted by International Data Corporation (IDC), which finds that 75% of B2B buyers and 84% of C-level or vice-president level executives use social media to make purchasing decisions. The early stage includes researching how the business can be improved, determining whether it’s worth investing in a solution and searching for possible alternatives. The middle stage consists of creating a shortlist of vendors and products. Recommendations from third-party experts are heavily valued at this stage. The final stage of the buying process includes finding answers to questions before they make a decision. This is the stage where buyers find social networks to be most valuable. If decision-makers use social networks during their buying process, then reps need to use social media to fill up your sales pipeline. If you don’t, your competitors will and this means that they will be earning new business, not you. So, how can you use social selling as part of your sales strategy? Let’s continue with the breakdown down of these social selling statistics to help you identify prospects, generate new business leads and earn more referrals. Best of all, the following sales strategies are GDPR compliant, so there’s no need to change anything since GDPR came into effect in May 2018. In the past, cold calling was the only way to find new business. Today, very few sales reps invest in cold calling to find new business. It’s because the traditional way of cold calling is no longer effective. A recent survey by InsideView found that more than 90% of decision makers said they “never” respond to cold calls! 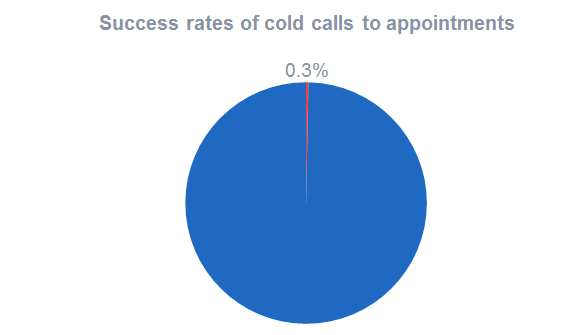 Furthermore, a study by Baylor University’s Keller Center for Research reported that the success rate of cold calls to appointments is only 0.3%. To put this into perspective, you would need to make more than 1,600 calls to generate 5 sales meetings. But, instead of cold calling, what should you be doing? Just because cold calling no longer works doesn’t mean that you cannot use a similar approach in social media. By that, we mean targeting businesses that you consider a good fit for your product or service. Prior to social media, this meant searching for prospects in local phone directories. 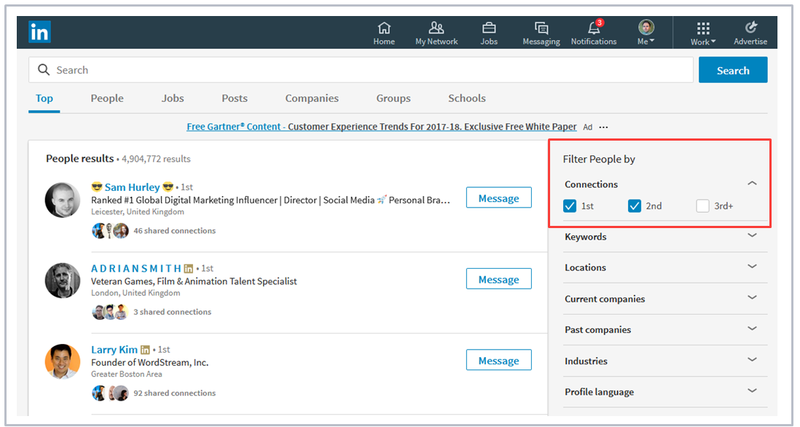 Now, you can target businesses on LinkedIn, except LinkedIn has a lot more data than a phone book! To begin with, create a list of companies that you want to connect with. You can target companies that are similar to your existing customer base or, you can target companies that you feel would be a good fit for your product or service. 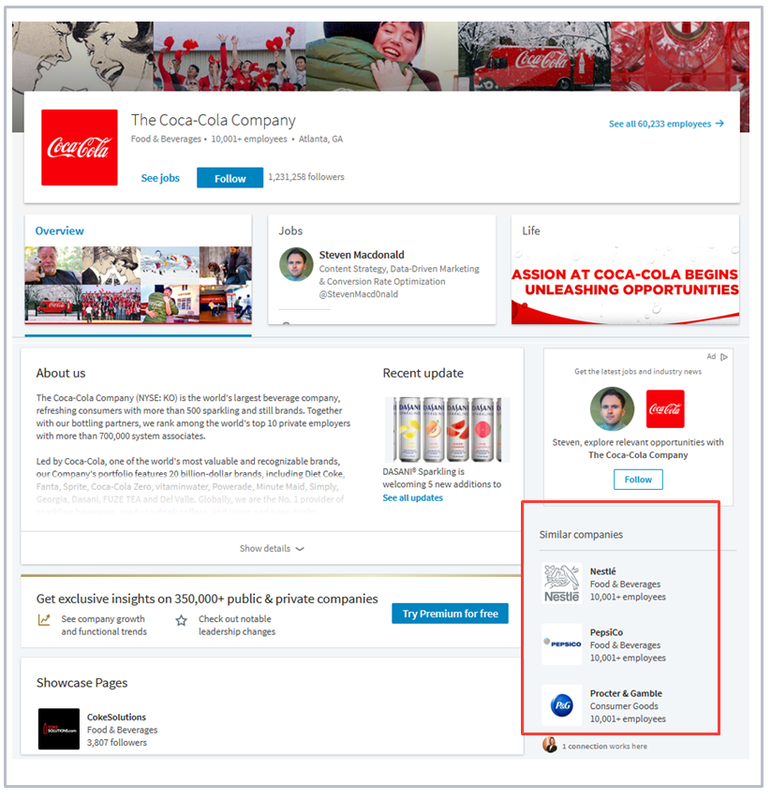 Click on these similar companies and then connect with them. Once you have connected, you then need to find the key decision maker at this company. If you’re selling a product for sales teams, this might be the sales director. Likewise, if you sell customer service software, then the right person will be a customer support director. It’s now time to request an invite to connect. Try to create a personalized message when you send a request, rather than the standard “I’d like to add you to my network…”. Hi [first name]. I’ve just joined [group name] on LinkedIn and I’ve really enjoyed reading your comments lately on [topic]. I’d love to keep in touch and learn more about your work. Are you open to connecting on LinkedIn? Hi [first name]. I see you work at [their company name]. It looks like we have a mutual connection in [mutual connection name]. Would you like to connect? Hi [first name]. I’ve been following your work for a while now at [their company name]. You’re doing an amazing job! I would love to hear more about your story and success. Looking forward to connecting with you. Once your request has been accepted, you need get on their radar. No, this doesn’t mean diving in with your sales pitch right away! Instead, you ‘’warm-up’’ your prospects by engaging with them when they are active. Whether that’s by sharing their content with your network, providing advice when they ask for it or by reaching out to them and asking for their input on any questions you may have. Of course, this approach takes time and it won’t lead to a sale overnight, but remember, social selling is a marathon and not a sprint. As soon as the buyer is ready to talk to you, that’s when you can pick up the phone and call them. Social selling is a great way to earn new business as buyers’ are actively using social media networks as part of their research phase. Conversations about you and your product are happening right now. All you need to do is get involved. But, unlike cold calling, the good news is that people are waiting to hear from you. According to a social selling study performed by LinkedIn, buyers that are active in social media are open to hearing from sales people and welcome input from industry experts. Therefore, try to position yourself as an expert in your industry. Becoming an industry expert is not something that you can achieve overnight. Malcom Gladwell, author of ‘Outliers’ says that you need at least 10,000 hours of practice to achieve mastery in a field. 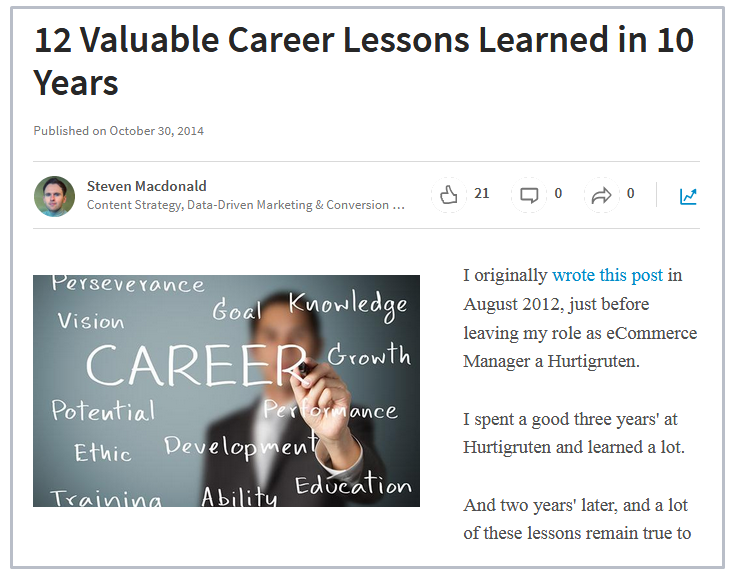 What better way to become an expert than sharing lessons from your own experience? People love to read unique perspectives on any given subject, especially when it comes to sales – whether that’s sharing prospecting tips, closing strategies or customer retention programs. Don’t be afraid of sharing mistakes you have made either. Sharing your mistakes and lessons you have learned will help prevent other people from making the same mistakes. And this builds trust! Another way to establish yourself as an expert is through training. To train someone on a specific topic requires expert knowledge, and it’s a great way to showcase your expertise. You can train people virtually by creating a video recording that shares best practice tips or how to use your product or service to achieve better results. Another option is to host a live webinar. 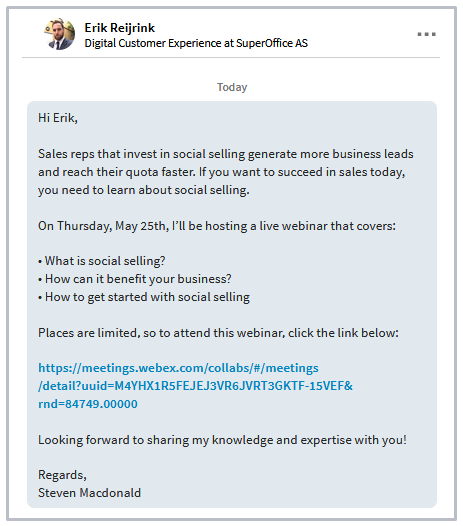 You can invite people to participate in your webinar through social media by posting the invite in your news feed, in active groups and by sending it to a select group of people using LinkedIn’s messaging feature. Once the webinar has ended, you can share the recording with your network. Becoming an expert is a long-term strategy. You start by building your personal brand, posting thoughtful content and sharing knowledge and insight gained from your experience. Once you reach this status, you will create more sales opportunities. You’re more likely to trust someone you know, than someone you don’t. And it’s the same in the business world. According to a Demand Generation Report, a warm referral increases the odds of a sales success up to 4 times, while 70% of B2B companies report that referrals convert better and close faster than other type of lead. The best part is that 84% of B2B buyers start their buying process with a referral. Relationships have always been at the core of successful sales. Even in the digital sales world, this hasn’t changed. Instead, social selling helps you become even more effective at building these relationships. A recent survey by CSO Insights and Seismic, 31% of B2B professionals said that social selling allowed them to build deeper relationships with their clients. A deeper connection builds trust. And it’s this trust that allows you request introductions and referrals from your network. However, sending a message to each of our connections asking for a random introduction will not work. To earn more referrals, you need a strategy. With a user base of nearly 600 million members, many of your customers will already have an account on LinkedIn. Therefore, the best place to start is by connecting with your customers. But, not just with any customer. Here, you want to connect with your favorite customers – the customers that you have helped in growing their business. Once you connect with them, browse through their connections and find people who you believe would be a good fit for your product or service. You can then ask your favorite customer for an introduction. This is why it’s important to connect with customers that have seen success by using your product or service. Having experienced the good results for themselves, they will be more than willing to refer you and your company to a new connection. Once you have had success with this strategy, you can turn to LinkedIn’s Advanced Search. LinkedIn has a powerful search function that allows you find people by location, company, position and more. Best of all, you can find people where you have a mutual connection (as shown below). By using your own network, you can reach more prospects through established connections. And as the average LinkedIn user has more than 900 connections, that’s a lot of potential new prospects to reach! Sales is a numbers game, but the more active you are on social media, the more successful you will be. In fact, studies show that sales reps with high social network activity achieve 45% more sales opportunities, and are 51% more likely to hit their sales quotas. There’s no denying the importance of social media’s role in the B2B buying process today. When a prospect is ready to buy, they turn to social media. And you need to be there! But, it’s not as easy as signing up to every social network and pitching your product at every opportunity. You need a strategy. This starts by finding prospects that are similar to your existing customers, establishing yourself as industry expert by sharing knowledge and insight and, by leveraging customer relationships to earn more referrals and recommendations. In doing so, you build long term relationships. And this is essence of social selling. Are you investing in social selling? 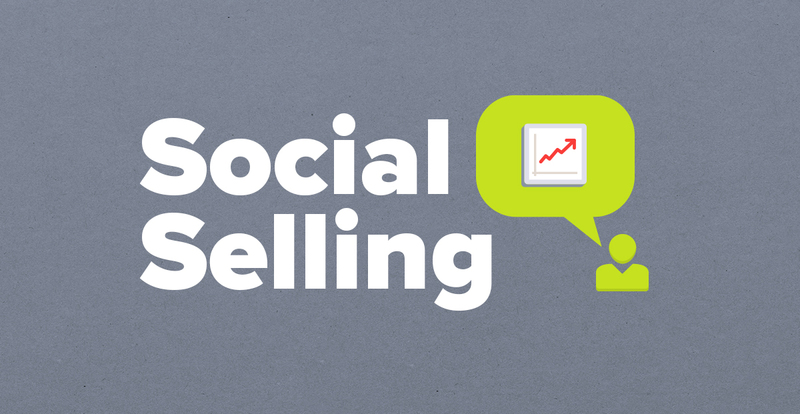 There’s a lot of social selling statistics in this post. Are there any important statistics that we missed? Let me know by leaving a quick comment and a link to the source below. Great pull together of stats to help the non converted sales dinosaurs who resist this new methodology. I would emphasise Social Selling is not an excuse to not pick up the phone or to stop using traditional skills and methods. It compliments a sales toolbag with new methods and tools to also use! If you can call someone and get through for discussion do that, don't resort to social by default. Thanks for the comment, Ian. I completely agree! Rather than stop with the traditional selling and only focus on social selling, sales reps should be using both! Very in-depth and well-researched article, Steven! I appreciate all the social selling statistics presented here. More consumers are exposed to social media, so companies should take advantage of social selling as much as possible. I think it's easier to filter more qualified leads that way. It's also a great way to interact and engage with customers. But I also agree with Ian's comment. It's never an excuse to not use traditional selling. Social selling just supplements it. "Just because cold calling no longer works doesn’t mean that you cannot use a similar approach in social media." - I love how you focus on doing research ourselves. I mean of course it is nice to rely on technology to do something for us but, people tend to forget that it is never a good idea to just have something given without any effort. Work and learn and that shall bring profits in the future. Great article Steven! I must admit, I am a Training Facilitator forced into sales role, but it feels great to get an unsolicited call from a potential client saying "I was referred to you by ..." or " In my previous company we used your services" this for me bears testimony to both great relationships with current clients and great products/services, I am most certainly getting rewarded for great delivery once the sale is concluded. My social selling game needs a boost though. Well said, Trevor! And good luck with social selling! Hi Steven, I'd love connect as we are looking for a speaker for our next sales conference and I feel you'd be a great fit! Hoping we can connect! Really useful and valid piece, thank you. I'm trying to learn more myself about social selling whilst also trying to encourage others that they should be doing it and it is worth it. My core industry is highways and transport with a lot of local authority clients so many will say 'this doesn't apply to us' but I disagree. There is no one sales channel any more, you have to be working various channels depending on your market and client base. Well said, Helen. I completely agree! Great article, thank you! "A recent survey by InsideView found that more than 90% of decision makers said they “never” respond to cold calls!" That is absolutely true. As the person in charge I prefer doing business with recognized brands or businesses, most of the cold-callers offers tricky products or they get you from here to there. "You’re more likely to trust someone you know, than someone you don’t." I will share it, thanks again.